We begin the tour at Jardim de Amazonia, a tropical jungle lodge that is the only place to see the newly discovered Cone-billed Tanager. Then we head along the 120km Transpantaniera into the heart of the Pantanal where we look for Greater Rhea, Golden-collared Macaw, Red-legged Seriema, Helmeted Manakin and more. There will be boat trips, feeding stations packed with birds and pools thronging with waterbirds. 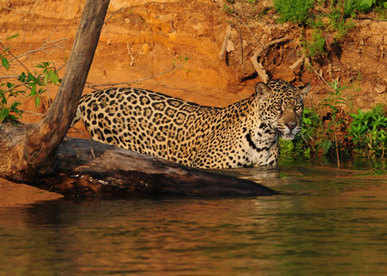 From our excellently located lodge at Porto Jofre we will see the exquisite Hyacinth Macaw and our boat journey along the Cuiaba River gives us an excellent opportunity to find that most enigmatic of large cats - Jaguar. Other wildlife that makes this region so famous includes Brazilian Tapir, Giant River Otter, Ocelot and plenty of other great animals. 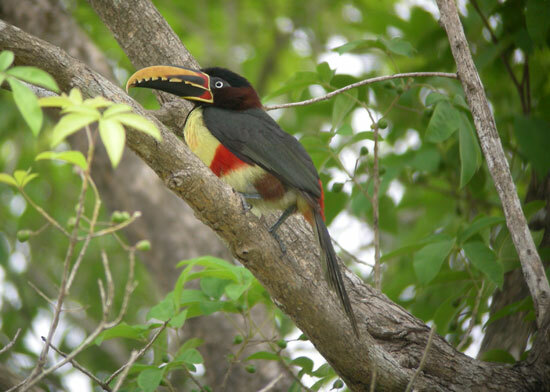 Our Pantanal tour offers a wide variety of birds and animals and will give a wonderful insight into this remarkable habitat. For those arriving from an international destination we advise arriving today before midday, note several airlines arriving in the morning. If you cannot arrive by midday then please arrive the day before on the 4th Oct and we can arrange and extra night for you. Night Jardim de Amazonia. This wonderful jungle lodge holds many species that are not available on the regular Pantanal trip and this is the only place in the world you can see the critically endangered Cone-billed Tanager a species only rediscovered in 2003. 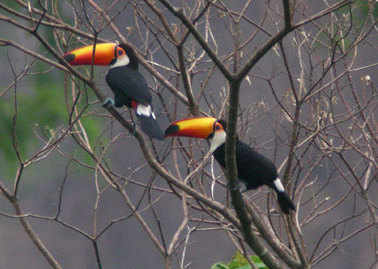 There are plenty of other superb birds in this area and we have 2 full days at this jungle lodge to enjoy them. What an amazing place this is! 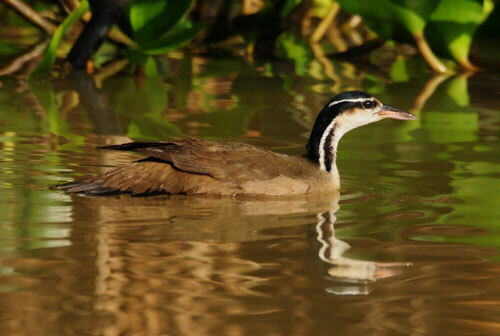 We will explore the area from a series of trails as well as by boat for such avian delights as Brazilian and Cinereous Tinamous, Razor-billed Currasow, Red-throated Piping-Guan, Ash-throated Crake, Black-bellied Cuckoo, Red-bellied, Red-shouldered, Blue-and-yellow and Blue-winged Macaws. Madeira Parakeet, Versicolored Emerald, Green-backed and Black-tailed Trogons, White-throated Toucan, Red-necked Aracari, Gould’s Toucanet, Blue-cheeked and Bronzy Jacamars, Barred and Cryptic Forest Falcons, Black-girdled Barbet, Red-stained and Ringed Woodpeckers, Natterer’s Striated and Spotted Puffbirds, Rufous-capped Nunlet, Black-fronted Nunbird, Pompadour Cotinga, White-banded Swallow, White-shouldered, Cinereous, Glossy and Natterer’s Slaty Antshrike, White-eyed, Amazonian, Sclater’s, Rufous-winged and Dot-winged Antwrens, Blackish, Grey, Rondonia Warbling, Band-tailed, Chestnut-tailed and Black-throated Antbirds, Point-tailed Palmcreeper, Striped and Buff-throated Woodcreepers, Rufous-rumped and Rufous-tailed Foliage-Gleaners, Short-tailed and Helmeted Pygmy-Tyrants, Sulphury Flycatcher, Stripe-necked Today-Tyrant, Cocoa Thrush, Para Gnatcatcher, Slaty-capped Shrike-Vireo, Amazonian Umbrellabird, Screaming Piha, Rose-breasted Chat, Pink-throated Becard Tooth-billed Wren, Bare-necked Fruitcrow, Brown-winged Schiffornis, Dwarf Tyrant-Manakin, Flame-crested, Fiery-capped, Red-headed and Snow-capped Manakins, White-vented Euphonia, Turquoise, Paradise, Bay-headed and Blue-necked Tanagers and Yellow-bellied Dacnis amongst an amazing variety of other species. 2 Nights at Jardim de Amazonia. After breakfast we will leave this fabulous lodge and begin the day with a drive through Pocone to the first part of the 120km long Transpantaniera, a dirt road that goes into the heart of this magnificent wetland. We should get our first taste of this truly magical area and we should have time today to drive and walk amongst patches of natural forest surrounded by dry floodplain and savannas. Here we will keep a look out for Greater Rhea and Red-legged Seriema plus countless waterbirds, storks and ibis. 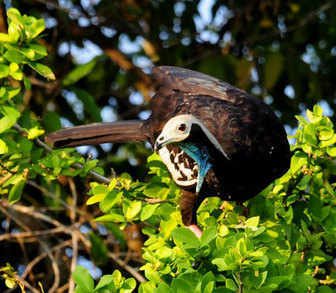 As we near our lodge our first Hyacinth Macaws of the trip will hopefully put in an appearance. Night Pousada Piuval. This morning we will search the surrounding fields and open areas for species such as Greater Rhea, Buff-necked Ibis, Plumbeous Ibis, the huge Jabiru, Golden-collared Macaws, Long-tailed Ground-Dove and possibly Yellowish Pipit. The scrubby forest and surrounding area should hold Great Rufous Woodcreeper, Rufous Cachalote, Chaco Chachalaca, Guira Cuckoos, Chestnut-eared Aracari, White Woodpecker, Masked Gnatcatcher, Black-fronted Nunbird, Planalto and Matto Grosso Antshrikes, Yellow-billed and Red-crested Cardinals plus a host of other species. After lunch we will continue our journey to our next lodge looking for Red-legged Seriema, Capped and Whistling Herons and Yacare Caimen along the way. At our lodge bird feeders attract Orange-backed Troupial, Bay-winged Cowbirds, Purplish Jay, Saffron Finches, and much more. 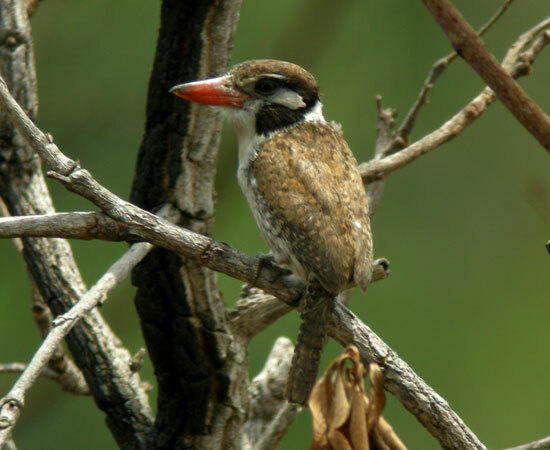 Campo Flickers and Crested Caracaras are almost tame and the nearby river holds many waterbirds. Depending on our time we may take a walk either this afternoon or tomorrow to a small patch of forest where we can look for Helmeted Manakin, Toco Toucan, Rusty-backed Spinetail, White-lored Spinetail, Fuscous Flycatcher, Rufous-tailed Jacamar, Black-tailed Marmoset and we have even seen Brazilian Tapir here. Night at Hotel Pantanal Matto Grosso. Dawn is shattered by the territorial duets of Chaco Chachalacas, the haunting cries of Southern Screamers, and the distinctive calls of Buff-necked Ibis. We then take a fabulous early morning boat ride onto the quiet waters of the Pixiam river. Here along weedy river edges and floating vegetation we can hope to get close and personal with many wonderful species. 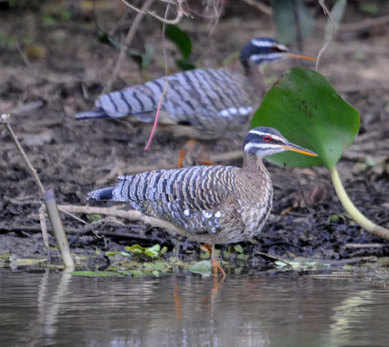 Sunbitterns are often absurdly approachable, Agami Herons incredibly shy and the Sungrebe always a challenge to spot. Our tranquil hours spent on the river should produce other excellent species such as Blue-throated Piping Guan, Bare-faced Curassow, Chestnut-bellied Guan, Boat-billed Heron, Pale-legged Hornero, huge Jabiru, Grey-necked Woodrail, American Pygmy Kingfisher, Green Ibis, Black-collared Hawk, Blue-crowned Trogon, Cocoi Heron, Roseate Spoonbill and a few other creatures such as Caiman, Capybara, Black-and-gold Howler Monkeys and if were lucky the superb Giant River Otter. Returning for a late breakfast we will then search some of the nearby forests and open wetland habitat for a multitude of species such as Whistling Heron, Plumbeous Ibis, Long-tailed Ground-Dove, Campo Oriole, Greater Thornbird, Rufous Cacholote, Rufous-tailed Jacamar, Mato Grosso Antbird, Ashy-headed Greenlet, Dull-capped Attila, Forest Elaenia, Pale-crested and Golden-green Woodpeckers, Campo Flicker, Rusty-backed Spinetail and the gorgeous Helmeted Manakin. We will then continue our journey along the Transpantaneria through the heart of the Pantanal, with plenty of opportunities to fully appreciate and enjoy one of the greatest avian spectacles anywhere in the world, as an amazing abundance of water birds, including a wide variety of ibis, storks, herons and egrets compete for our attention. We can expect extremely close views as many species feed next to the road, allowing superb photographic opportunities. Eventually we will arrive at the end of this road and our lodge where we spend the next 2 nights. Night Porte Jofre. 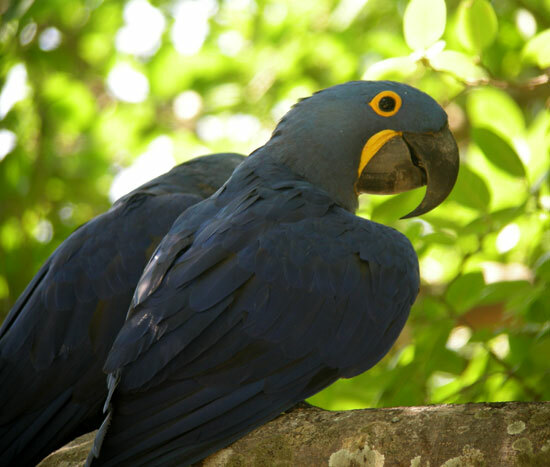 Our well positioned base allows us ample opportunities to find some of the areas best birds, including the world’s largest parrot, the fantastic Hyacinth Macaw. This is sure to be a memorable experience and one of the major highlights of the tour, as we watch these spectacular birds fly to and from their roosting trees.The main focus of today however, will be to embark on a boat trip onto the Cuiaba River where our primary target species is the magnificent Jaguar, and absolutely awesome predator that is on most wildlife watchers wanted list. In the heat of the day these animals come down to the river banks to rest in the cool breeze that comes off the water’s surface. 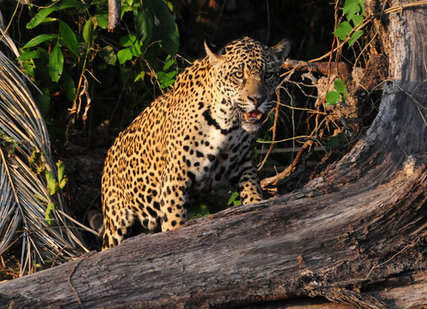 The success rate of seeing Jaguars here has improved enormously over the last few years as the locals guides knowledge on how to find them has also improved. We stand a very good chance, but no guarantees as it is nature and not a zoo! There will be plenty of avian distractions as we search for Jaguars and we can expect species such as Large-billed and Yellow-billed Terns, Black Skimmer, Rufescent Tiger-Heron and Wattled Jacana. We could also come across Giant River Otters. In the evening we may make use of spotlights to search for a variety of nocturnal wildlife. 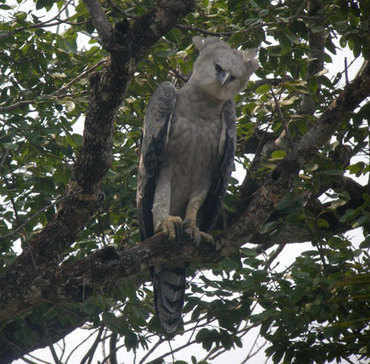 With luck we could find Brazilian Tapir, Giant Anteater, Crab-eating Racoon, Margay and Ocelot, as well as both Nacunda and Band-tailed Nighthawks. Nights Porte Jofre. This morning we will spend time birding around our lodge before making our way towards our next destination in the dry Chapada dos Guimaraes for a three night stay. Here, the high plains of central Brazil abruptly come to an end, with the habitat changing to reveal rocky outcrops, canyons, riverine and cerrado forest with ferns, orchids and bromeliads. 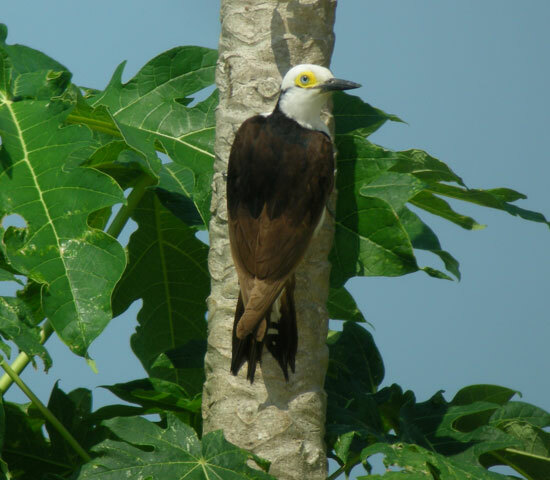 This stunning area offers excellent birding amidst spectacular scenery. A whole new range of bird species await us and from our well positioned lodge we will have birds and wildlife right on our doorstep. Just a short distances away amongst the dry Chapada we can see a variety of species such as Red-winged Tinamou, Yellow-ridged Toucan, King Vulture, American Swallow-tailed Kite, Crested Black-Tyrant, Peach-fronted and White-eyed Parakeets, Curl-crested Jay, Red-and-Green Macaw, Blue-headed Parrot, Biscutate and Greater Dusky Swifts, Horned Sungem, Dot-eared Coquette, Cinnamon-throated Hermit, Fork-tailed Woodnymph, Blue-crowned Motmot, the endemic Rufous-winged Antshrike, Chapadas Flycatcher, Plain-crested Elaenia, Southern Scrub Flycatcher, White-eared and Spot-backed Puffbird, Large-billed Antwren, Planalto Slaty Antshrike, Masked Tityra, Band-tailed and Helmeted Manakins, White-bellied Warbler, Campo Flicker, Thick-billed Euphonia, Guira, Black-faced, Grey-headed, White-banded, Cinnamon, White-rumped and Swallow Tanagers, Stripe-tailed Yellow Finch, Coal-crested Finches, Collared Crescentchest and possibly the mighty Crowned Eagle amongst a host of other species. We have even been lucky enough to see the elegant and rare Maned Wolf here! Nights Pousada do Parque. We have two full days to explore this fabulous area where we could find such species as Ornate Hawk-Eagle, Laughing Falcon, Channel-billed Toucan, Rufous-bellied Thrush, Green-barred Woodpecker, Masked Tityra, Wedge-tailed Grass-Finch, Rusty-backed Spinetail and White-backed Fire-Eye. Pheasant Cuckoos are also in the area but are incredibly difficult to see so we would need luck on our side to actually see one. Beside a wonderful waterfall we can see Biscutate and Great Sooty Swifts as well as White-eared Puffbird, Blue-shouldered Macaw and with luck the elusive Blue Finch. Another great area holds the rare Yellow-faced Parrot, plus Chapada Flycatcher, Swallow-wing and both Least Nighthawk and Little Nightjar towards dusk. This is also a super place to see Red-legged Seriema. 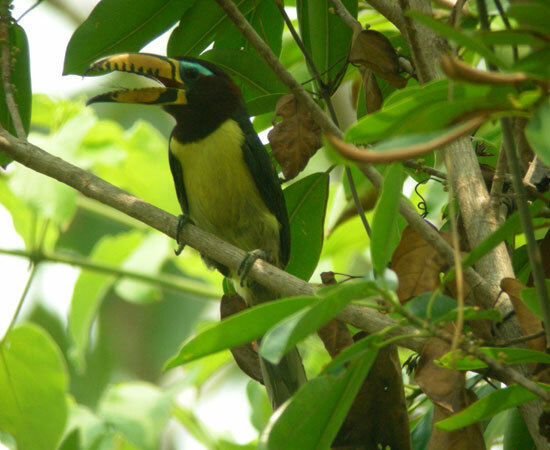 A patch of woodland offers us the chance to see Band-tailed and Fiery-capped Manakins as well as White-backed Fire-eye, Yellow-ridged Toucan and Amazonian Motmot. The beautiful lodge is a pleasure to come back to each day and the food fantastic. If we get to see a Maned Wolf it would make it even better. We will have a final look around this wonderful area if time permits before heading back to Cuiaba in time for our afternoon international departing flights.